Luma Mufleh moved to the United States from Jordan. She coached a team at the YMCA and ran a cafe, but found herself strangely unsatisfied. Almost by accident, she finds herself in the small town of Clarkston. Clarkston was a traditional small town with a huge and sudden influx of refugees. She finds boys from countries all over the world playing soccer in the streets. Luma decides that those boys need her more than her YMCA girls, and becomes the coach of a ragtag team called The Fugees. Mr. St. John does an excellent job of bringing Luma, the kids, and the town to life. While he cannot focus on all of the players (Luma eventually ends up with 3 teams), he does give insight into a variety of kids from different countries and the problems that they faced as young immigrants. Their lives are incredibly difficult - many of them have come to the US direct from war zones with incomplete families. There is little assistance for them to assimilate into their school system or for their parents to find jobs. Violence is no stranger to their lives in the US either, whether it is from immigrants from warring nations or from the 'old' residents of Clarkston's prejudice. That being said, St. John does not make the citizens of Clarkston villains. He points out the sense of confusion when it seems as if your town has literally changed overnight and the ease of misunderstanding across cultures. He is also quick to point out the ways in which people opened their arms and their town to the new residents. This book is about a soccer team. and there is no shortage of stories about practices and games. As someone who grew up playing soccer, I loved reading the accounts. I think it is accessible to anyone though, even if the reader is not a soccer player or fan. It is fascinating to witness the players grow, as they go from boys who love soccer but not each other to a well-practiced team of boys who love and respect both their coach and each other. Luma does not have an easy job. In addition to honing the boy's athletic skills, she must fight for them to have a place to practice, ease the tensions between players of different ethnicities, and gain the trust and respect of children who have gone through some very dark situations. You know it's the sign of a good book when you turn the last page and wish that there was more to read. I think that it says a lot about the story of Luma and her team - it's not over yet. Luma plans to continue to coach new generations and the experiences that the boys face as immigrants do not change once they become adults. 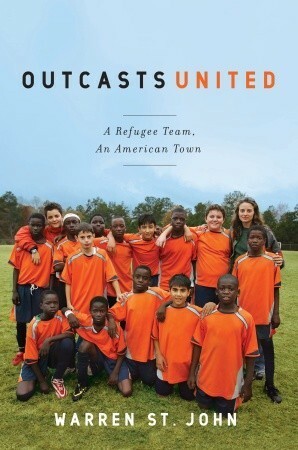 This is a great book for anyone who loves the game of soccer but, more than that, it's a story that will (re)open your eyes to the difficulties that immigrants face in our country every day. That IS a great sign of a good book! I love/hate that feeling :) This sounds like something I'd really like. It was a great read. I'm really glad I picked this one up.